Hulu Plus subscribers with Google Android phones (s goog) can now watch their favorite movies and television shows on the go, thanks to a new app in the Android Market. The software is free and offers some no-cost videos, but the majority of the content is available to premium subscribers of Hulu Plus, costing $7.99 per month. 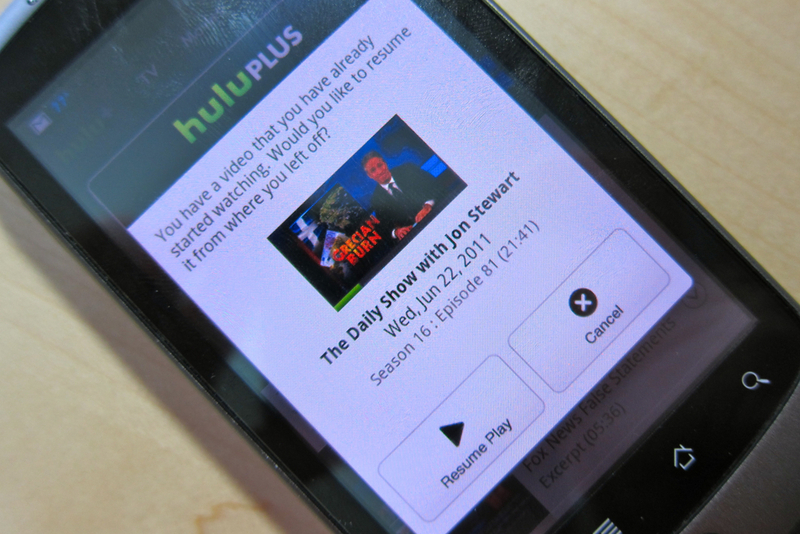 Similar to the recent rollout of Netflix (s nflx) for Android, however, Hulu Plus is initially only available on six specific handsets. The short list of compatible smartphones includes the Nexus One, Nexus S, HTC Inspire 4G, and three Motorola (s mmi) phones: the Droid 2, Droid X, and Atrix 4G. In a blog post announcing the software debut, Hulu Plus says that it “expects to add to the number of Android smartphones and will be making additional device announcements throughout the year.” Although the company didn’t explain why the rollout will be staged, the reason is likely related to DRM, or digital rights management, security. Netflix, for example, says it must test its software on each handset model before supporting it, to ensure that the content can’t be pirated or viewed without a subscription. I recently started a Hulu Plus trial on my Xbox 360 (s msft). I still have a Google Nexus One handset, so I installed the software this morning. The overall experience is solid, and once I signed in to my account in the app, I was watching television shows within a minute. The app worked fine for me on a 3G connection, too, so it isn’t restricted to Wi-Fi only. Of course, using mobile broadband to stream video can eat through a bandwidth cap. However, the Hulu app provides options for regulating data use. There are three streaming quality options in the app: high, medium and low. The high setting reduced noise and brought clarity, but for mobile viewing, the medium setting looked fine to my eyes. The software will save your place when pausing or stopping a video, and you can pick up where you left off on another device; start watching on the phone and finish up on the big screen, for example. Searching for programs is simple and effective, and I like how the application provides a history of watched content. You can sort programming by most popular, newest and by network, as well. If I decide to keep my Hulu Plus subscription, having the mobile app will be a no-brainer. Then again, I’m one of the lucky ones, given that I have a compatible handset. For Hulu, Netflix or any other video service to really get popular on Android, it’s going to have to quickly add support for new handsets. That issue aside, another one, at least to me, is that Hulu Plus still shows advertisements, even though it’s a paid service. That’s the case on a computer or on my Xbox 360 as well, but all those little advertisements will add up to wasted mobile broadband bandwidth on a handset; it’s probably not enough to push people over a data cap, but it’s annoying nonetheless. Perhaps if Yahoo (s yhoo) buys Hulu, as some think it should, it won’t need to supplement the subscription price with ads. Then again, that deal looks like a tough sell for a number of reasons.